As a longtime return visitor and former part time resident, I feel compelled to visit Maui on an annual basis. It gives me a chance to see old friends, make new ones, and bask in the beautiful sea and beaches that Maui is best known for. I usually stay in the Kihei area, where my old condo was located, and this time was no different, opting for the budget yet comfortable accommodations at the Aston Maui Banyan, just across from Kamaole Beach Park II. Kihei has a nice blend of locals and tourists, with plenty of shops and good restaurants, decent nightlife, and easy access to sunny South Maui’s golden sand beaches. From here it is just a short drive to Wailea and Makena, where the island’s best beaches and resorts are waiting for you. 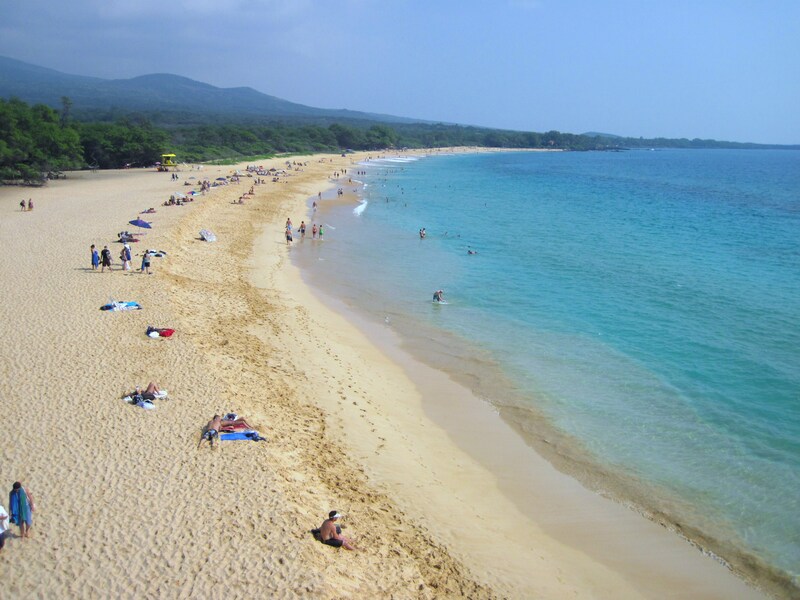 I usually head past all of the luxury hotels, down to Makena Beach, my favorite on the island (if not anywhere). Both Big and Little Beach (the clothing optional side) beckon on any given day, and Makena delivers with one of the longest stretches of golden sand and bright blue waters of any Hawaiian island. It is Sunday afternoon, so I cross over the short but steep lava cliff trail to Little Beach. Sunday sunsets are an institution there, complete with a drum circle, fire dancers and large gatherings of people from all walks of life, but bordering on the bohemian side. I have no problem feeling at home there, and enjoying the body surfing is always a great way to spend the afternoon. After sunset we head over to the Four Seasons Hotel (what a contrast) to enjoy the gypsy violin and guitar duo playing in the outdoor restaurant there. Besides the amazing beaches, Maui is known for its verdant valleys and numerous waterfalls along the North coast to Hana. I always enjoy the short hike and swim at Twin Falls, the first stop on there Hana Hawaii. We are visiting friends in Haiku that live in a temple like hexagonal wooden palace overlooking the Pacific. There is an impromptu party with belly dancers (not hula dancers), musicians, great home cooked food and drinks. Mirayah, a local belly dance instructor is our host and gives us a chance to reconnect with old friends. Snorkeling is always great on Maui, and we find an amazing spot just before the lava studded south road ends at La Perouse Bay. Here I have swam with spinner dolphins on many occasions, but the wind is coming up, and no dolphins are to be found, so we go out at one of the lava rock turnoffs that are part of the Ahihi-Kinau Marine Preserve. The area is uncrowded, sheltered from the wind, so the is water crystal clear, with multitudes of tropical fish, and the occasional sea turtle. We see whales spouting in the distance. Maui has a vibrant music and dance scene, as well as a great Cultural & Arts Center, showcasing all sorts of performances. One evening we take in the show Ula’lena which has been running in Lahaina for over 10 years. A cross between Cirque du Soleil and the Polynesian Cultural Center, the cast of Ula’lena present the myths, history and magic of Maui in a way never before seen or heard. The show features thundering drummers and live musicians, aerialists, dancers, acrobatics, comedy and performance art, all in the theme of Hawaiian mythology and culture. I highly recommend taking in this show during your visit for something unique. You are currently browsing the South Pacific Vacations' Weblog blog archives for August, 2011.